NOTE:---This booklet is designed to supplement the lectures on OSS organization. The student may retain his numbered copy of the book for reference during the course, but it must be returned to the Chief Instructor on demand. Special security precautionb must be taken by each student not only to safeguard the information contained herein from unauthorized persons, but also to protect the book itself against loss or damage. The information contained in this book is a privileged communication to OSS students and is designed to help them understand and perform their jobs intelligently overseas or in the States. This information is not to be imparted to unauthorized persons outside the organization. NOTE:--A "Glossary of Frequently Used Initials" appears at the end of this book. The Office of Strategic Services (OSS) is an agency of the Joint Chiefs of Staff charged with collecting and analyzing strategic information and secret intelligence required for military operations, and with planning and executing programs of physical sabotage and morale subversion against the enemy to support military operations. The OSS is dynamic. It is constantly changing organizationally and in scope of activity. It is in a continual state of adaptation to the needs of the war in the United States and to peculiar conditions in the various theaters of operations. Some of the Charts and the text which follow might have become inaccurate in a few details in the time required to publish them. Changes in this booklet will be made from time to time. But the basic aims and functions of the organization will change little. 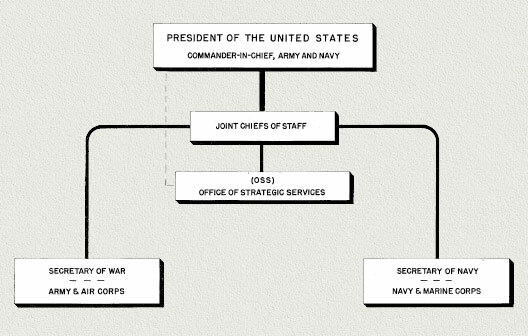 This simple chart explains the lines of responsibility and authority connecting the OSS with the President, as Commander in-Chief, through the Joint Chiefs of Staff. OSS is divided into a number of Branches, each Branch being responsible for a particular function. In the theaters of operations, Branch representatives are often called upon to assist in performing the functions of other Branches, and the functions of all are closely coordinated by local and theater commanding officers. The two large OSS functions (Intelligence Services, and Strategic Services Operations) are administered by two deputy directors. Under each deputy director are the several Branches which carry out particular parts of those larger functions for which he is responsible. The SI (Secret Intelligence) Branch is responsible for dbtaining secret intelligence by means of espionage throughout the world, except in Latin America, and by liaison with other Allied intelligence agencies engaged in espionage. It recruits agents, sets up chains of intelligence in neutral and enemy-occupied territory, and exploits existing sources for clandestine intelligence such as underground and guerrilla groups, and Allied secret intelligence sources. SI deals largely in spot intelligence reports (called SI disseminations). The X-2 Branch is responsible for counterespionage abroad as well as some security functions in connection with our missions in the active theaters. The Branch's spot intelligence products are used largely in support of the Army's CIC, and the Branch works closely with the FBI. The R&A (Research and Analysis) Branch is a reÂsearch Branch which coordinates intelligence from all sources and produces finished intelligence studies of a strategic, political, geographical, and economic nature. R&A's published contributions to the war effort have been numerous and important. FNB (Foreign Nationalities Branch) has domestic functions within the United States. It studies constantly the political temperature of the various nationality groups in this country in relation to political events abroad, and publishes timely reports. The CD (Censorship and Documents) Branch has dual functions: (a) the securing of censorship materials for the organization, and special monitoring of enemy broadcasts for commercial and economic intelligence as well as political intelligence; and (b) research in, and supply of personal documents required for undercover operations by other Branches. also organizes special teams which are sent behind the enemy's lines for the destruction of specific targets, for securing intelligence, and waging guerrilla warfare. 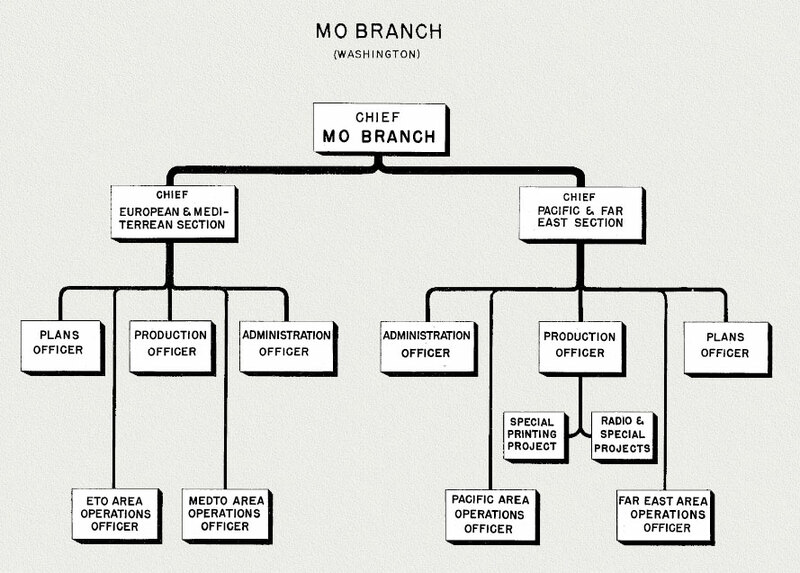 The MO (Morale Operations) Branch is responsible for subversion of the enemy's morale, at home and at the front. Its techniques are called "Black" propaganda; that is, propaganda which purports to come from a source other than the stated one. Its weapons are "black" radio, leaflets, rumors, poison pen letters, and a variety of "black" newspapers and other publications. MU (the Maritime Unit) was organized to carry out sabotage against enemy shipping by use of such means as underwater demolitions and stealthy forays into enemy harbors. The contribution of this unit has been most important in the field of water transport for agent infiltrations and the supply of agents and underground groups. The Special Projects Branch is organized to carry out missions of a specialized nature that do not fall in the jurisdiction of any other branch of SSO. The Field Experimental Unit is a special operational group included in the SSO division for administration. Planning and Operations of this group, however, is done under direct control from the Director's Office. The OG (Operational Group) Command organizes and operates guerrilla forces in deep penetration operations. In China, and in other places, it has trained and officered guerrilla bands recruited abroad. In France just prior to and immediately after D-day the OG Command dropped groups for liaison and support to the Maquis. All other parts of the OSS organization serve it in either an administrative or a supporting and supplementary manner. The S&T (Schools and Training) Branch trains OSS personnel both in the United States and in the several active theaters. This Branch is also responsible for the preliminary screening of recruits for service overseas by means of a psychological assessment program. The Planning Group is the top planning and advisory group to the Director (Major General William Donovan), and it consists of about half a dozen men, two of whom are representatives of the Army and Navy on the highest echelon. The Planning Staff performs research and technical services in support of the Planning Group's program proposals. The Registry of the Secretariat registers and stores the periodic OSS mission reports and other reports from the field. The Reports Office (not to be confused with the Reporting Board, which is a part of the SI Branch) is an editorial and routing office for such reports. The Field Photographic Branch is the motion picture production and picture taking Branch which records OSS activities in the States and abroad. It prodUces OSS training films. And it has performed strategic photographic missions for OSS, the Army, an the Navy overseas. Personnel of Field Photo accompanied the OSS City Teams whidh were dispatched quickly to newly liberated European cities. The VP (Visual Presentation) Branch employs artists and designers. Its function is to present pictorially and in chart form all OSS activities. It is alsb the procurer of motion picture films produced outside the organization, and it has done such other jobs as the preparation of special training aids for the S&T Branch. The R&D (Research & Development) Branch acquires, develops, and supplies special, sabotage and other devices for use in field operations such as:--camouflaged devices for carrying concealed messages; various explosive devices and weapons. The Hq and Hq Detachment, and the Naval Command perform the usual headquarters functions for Army and Navy personnel assigned to OSS. The Naval Command is also the liaison and funnel for all DNI intelligence coming into OSS, but there are special Intelligence Liaison Officers for liaison with MIS, G-2 and the JICAts. The Security Branch checks the security of all personnel before recruitment and is responsible for the physical security of OSS establishments in the United Staten and abroad. The Special Funds Branch disburses "unvouchered" funds made available by Congress for which the organization is not accountable in detail, for obvious security reasons. This Branch is also responsible for the acquisition of the necessary foreign exchange in the field in support of undercover operations. The Chief Surgeon is head of the OSS medical units here and abroad. This organization is responsible for the health of OSS personnel, and maintains small but well equipped hospitals at bases for treatment of illness and casualties. Officers of this Branch have also contributed to, and helped to evaluate, our fund of medical intelligence from enemy and enemy-occupied territory. All the other Branches and divisions identified on the chart perform functions which their names imply. 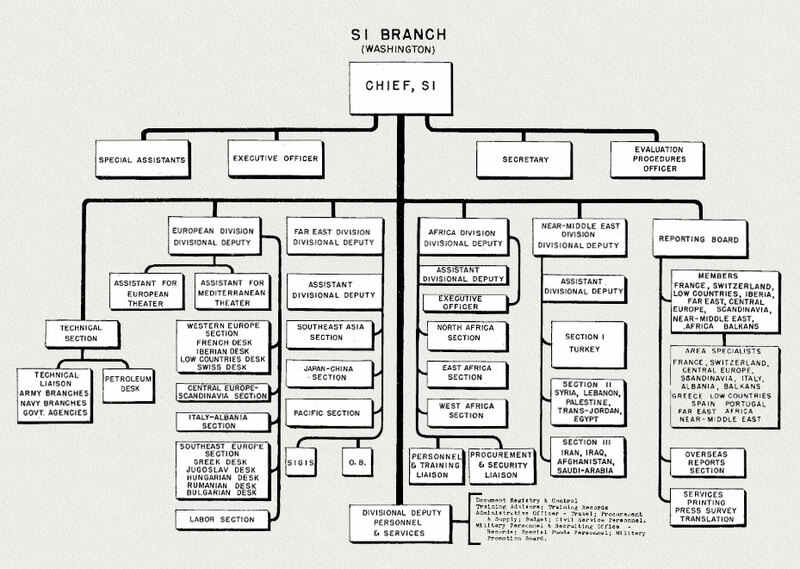 This chart of SI Branch organization in Washington is largely self-explanatory, but the following comments might be in order. The various geographic Divisions and Sections are responsible for supporting activities in the theaters of operation with which they are concerned. They are responsible for seeing to it that adequate personnel are recruited, trained and dispatched overseas, that the needs and requests of the SI representatives abroad are met, that secret intelligence activities in the various theaters are coordinated and given over-all policy direction) that SI activities in Washington and abroad are coordinated with those of other Branches of OSS, and that secret intelligence reports from OSS organizations and representatives overseas are brought to Washington, processed and distributed to "customer's" within OSS and throughout the U.S. Government. In addition various "staff" Sections, such as the Technical Section and the Labor Section, are responsible for carrying out special functions within the various theaters of operation. The Labor Section, for example, is charged with establishing contact with organized underground labor groups abroad for intelligence and subversive activities. Dissemination of all SI reports is made through the Reporting Board, to which all reports go for final editing and evaluation after being processed by the geographic Section concerned. In each of the principal theaters of military operations there are similar organizations, charged with the responsibility of obtaining secret intelligence from original sources and Allied secret intelligence agencies, and supplying these reports promptly to authorized "customers" in the theater before sending them to Washington. Coordination between the four main geographic divisions of SI is necessary because of the global nature of intelligence. For example, considerable technical and political intelligence concerning Japan was found in newly liberated regions of Europe, and personnel of the SI European Division exploited these sources for the benefit of the SI Far East Division. While the SI organization in each theater heads up into the OSS HQ for the theater, SI sub-bases and representatives are inevitably spread throughÂout the theater, SI agents in turn extending out from these. Networks of SI agents in North Africa and Europe furnished many reports, military, political, economic and psychological, both before and after the respective D-Days. The story of their preparation for the invasion of North Africa, for example, is now well known. As another example, according to official 7th Army statement, SI agents furnished 50-60% of all ground intelligence used in the Allied invasion into southern France and the drive northward to Germany. While before D-Day secret intelligence was, obtained by means of individual agents introduced by clandestine means from Allied bases into enemy-held territory, after D-Day SI men were attached to the advancing Armies on corps and divisional levels for tactical intelligence operations in France and Germany, and these tactical detachments briefed and dispatched agents recruited on the spot for shallow penetrations of the enemy lines as the fronts advanced. During the post-hostilities period in Europe, SI has been entrusted with various intelligence assignments connected with the occupation of Germany and Austria. Bases abroad, and techniques of operations are being changed to meet the new conditions. In the Far Eastern theaters, SI has virtually completed its coverage of the India-Burma theater, and is being called on in the China theater for constantly widening coverage. The target area, (Japan and the so-called Inner Zone), presents a problem even more difficult than that in Europe, and one which will test to the full the resources and skill of the SI Branch. 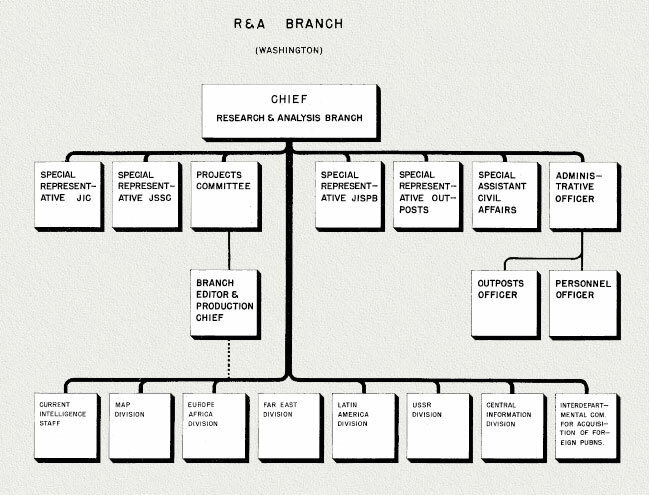 The R&A Branch draws upon all available sources for secret intelligence and for regularly published information. It analyzes, correlates, and interprets this mass of material and produces finished intelligence studies. In Washington, the R&A Branch is the OSS central repository for all incoming intelligence from whatever source:--MIS, DNI, our Allies, other government agencies, other OSS Branches. 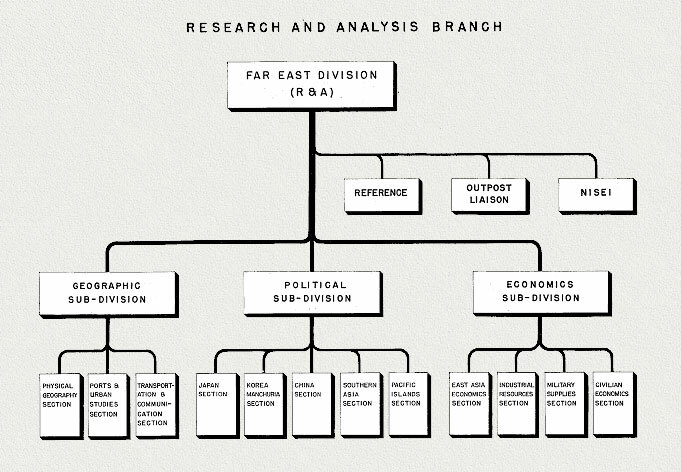 The Branch produces a steady stream of intelligence studies on almost any country or topic upon demand of the Army or Navy or other authorized agency or Branch of OSS. The R&A Branch produces weekly situation reports covering the world politically and economically. Some of the Branchts most important contributions have been Joint Army-Navy Intelligence Studies published under the authority of the Joint Chiefs of Staff, and the Civil Affairs Handbooks and Guides published by the Army and Navy. 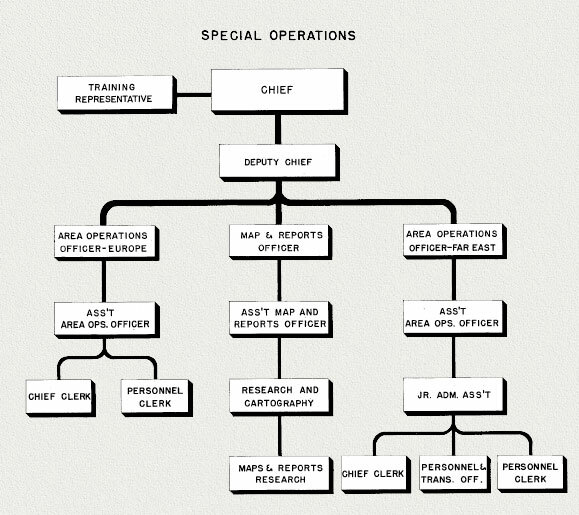 The five special staffs of representatives in the top row of boxes in the chart, perform liaison and coordinating functions as between R&A and other government agencies and the Army and Navy. The special assistant for Civil Affairs is necessary because of the size and importance of the R&A job of producing Civil Affairs Guides and Handbooks. The Projects Committee must authorize and apÂprove all study and research projects of the R&A Branch. Upon approval, studies and other publications are turned over to the Branch Editor who edits them, sees to their publication and distribution to authorized "customers". 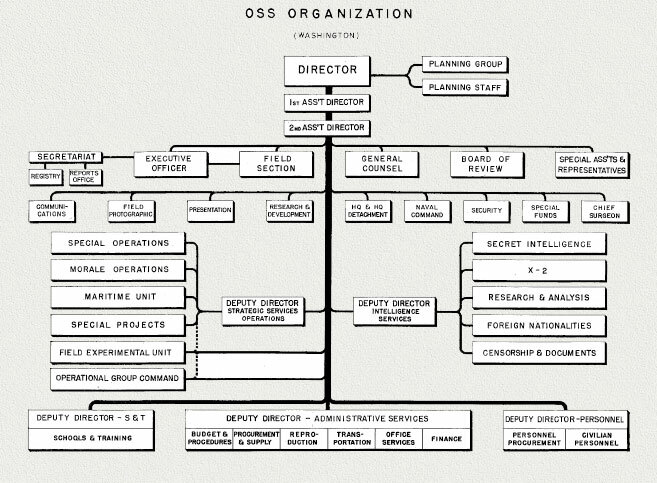 The Current Intelligence Staff maintains a War Room for the top executives of the OSS. It also produces the Current Intelligence Studies, which are sometimes abbreviated R&A studies, and it produces a daily situation report for use in the Mar Room. The Map Division has one of the most complete collections of maps--on microfilm as well as on paper--in the world. It collects maps from all sources through regular OSS intelligence channels as well as from the Navy, the Army Map Service, the State Department, and other government sources. The Map Division maintains a cartographic section for the drawing and publishing of special OSS maps to be used in OSS intelligence studies, and it produces relief models which are used by Army and Navy for strategic planning as well as by the Army Service Forces for its weekly and widely circulated Newsmap. It supplies maps in large quantities for use by OSS personnel and for the Armed Forces. Branches. This Division is complex organizationally and functionally. In addition to maintaining an extensive library for OSS, this Division also collects and catalogues photographs of a strategic nature, maintains an extensive card index on foreign personalities, and receives and makes available documents from a wide variety of sources including MIS, DNI, Department of State, Allied governments, other OSS Branches, Office of Censorship, Justice Department, Treasury Department, etc., etc. Documentary materials are carefully catalogued and indexed for research purposes. The Interdepartmental Committee for the Acquisition of Foreign Periodicals has the function of collecting, in the original and on microfilm, copies of all, sorts of foreign newspapers, periodicals, books, technical and trade magazines, etc. This committee, although OSS financed and sponsored, serves all the United States Government war agencies with desired foreign publications. R&A, like the other Branches, is represented in the OSS missions overseas. The Branch's specialized efforts are brought to bear directly on intelligence problems in the particular theaters, and R&A men have performed a variety of jobs in the field. In Italy, R&A representatives not only performed almost on a diplomatic level in reporting political and military intelligence in the liberated regions, but they interrogated prisoners for enemy economic intelligence, prepared air target studies in collaboration with the Air Forces, and helped to direct the efforts of other Branches in obtaining useful and needed intelligence. R&A representatives were in the first parties to arrive in liberated Balkan capitals and large central European cities in order to assist in quickly obtaining important intelligence materials left behind by the enemy. In Burma, R&A men helped to brief SI native intelligence agents. R&A Branch maintained a large staff in ETO to render strategic intelligence services to the Army and Air Forces there, and representatives of the Branch have moved to the Continent with OSS missions. The Far East Division, organizationally, is typical of the four other R&A Geographical Divisions, except that it maintains a separate library of Far Eastern books and publications apart from the main OSS library which is a part of the Central Information Division. There are three principal Washington sub-divisions responsible for Far East intelligence in the fields of (a) geography and topography, (b) politics, and (c) economics. The production of a strategic survey on a Far Eastern country would involve the joint efforts of these three sub-divisions. The Geographic Sub-division would contribute information on the topography of the country, the rail, telegraphic, telephone, and road communications, the weather, ports, airfields, cities, etc. The Political Sub-division would contribute the sections of the survey dealing with the political structure and the current political situation within the country. And the Economic Sub-division would contribute the sections of the survey dealing with military supplies, food, industry, raw material supplies, production potentials, location of industries, etc. The sub-division distinctions apply to R&A, Far East Division, in Washington. They tend to disappear in the Division's organization in the Far East theaters of operations where representatives of the Division must be versatile in all intelligence aspects of the countries for which they are responsible. The SO Branch operates behind enemy lines and from bases in Allied or neutral countries. The chief functions are: (1) sabotage, (2) organization and conÂduct of guerrilla warfare, (3) contact and support of underground resistance groups, (4) special operations not assigned to any other Government agency. Prior to D-Day, SO had installations in ETO for training agents and Jedburgh personnel and supplying resistance groups. They also materially aided the rescue of downed Allied fliers. These operations continued after D-Day in addition to dropping Jedburgh teams into all parts of France where they directed Partisan resistance in harassing the German Army. The outstanding achievement was the holding of the 3rd Army's right flank during the breakthrough from St. Lô. Joint SO/SOE schools trained 500 Norwegian nationals who reentered their country to receive air drops of supplies and lead sabotage activities. In the Mediterranean Theater SO dropped huge quantities of supplies to Partisans in Italy, acted as liaison with Balkan resistance forces, and directed teams in physical subversion. An example of their effectiveness in Greece was the cutting of the main railroad route between Turkey and Greece for a considerable period of time by blowing several bridges. SO Branch also evacuated more than 3,000 downed airmen. In China, the SO Branch has perhaps its most favorable opportunity for extensive operations. In connection with U.S. Army offensives in China, SO has great strategic value. One of the most effective operations has been the sabotage of enemy communications and supply lines by demolition teams with the aid of Chinese guerrillas. The SO Branch has contributed directly to the war effort by planning, organizing and executing harassing operations and direct sabotage at crucial points. By assisting conquered peoples to liberate their countries, Special Operations has proven its value in the Allied Cause. Operational Groups have a dual function, (a) they serve as the operational nuclei of guerrilla organizations which have been formed from resistance groups in enemy territory, (b) they execute independent operations against enemy targets on orders of the theater commander. CO works with individuals unfamiliar with military operations as well as insufficiently-equipped quasi-military organizations. The former are organized and trained in military techniques of resistance. The latter are provided with supplies and their tactics are coordinated with allied military plans. Leadership is normally kept in the hands of the native people, though OG may select leaders and unify opposing groups. The aim of CG activity is to aid actual and planned Allied military operations by harassing the enemy behind his lines, by disrupting his lines of communication and supply, and by forcing him to divert troops to protect himself from guerrilla attacks and wide-scale uprisings. The activities, mode of operation, and personnel of OG differ from those of the Special Operations Branch. OG personnel activate guerrillas as military organizations to engage enemy forces. They always operate in uniform as military units and are not primarily concerned with individual acts of sabotage. The Plans Sections originate weekly, strategic intelligence directives and summaries for dispatch to the field, suggesting their adaption to field operations. The Plans Officers, in liaison with the OSS Planning Staff, insure that MO activities conform to approved OSS policies as directed by the Joint Chiefs of Staff, State Department, etc. The Production Officers expedite the physical production of material for the campaigns and projects prepared by-Desk Officers. Since MO, according to OSS General Order No. 9, "is responsible for the conduct of subversion other than physical", its mission is to create internal dissension between groups, distrust between allies, and to unify and strengthen dissident groups so that the enemy's fighting capacity is impaired. 1. Objective--WITHIN THE ENEMY STATE, MO seeks deepen and enlarge the differences among enemy groups and peoples by creating resentment, friction, and civil strife among them. Black Radio Campaigns--Posing as "freedom stations" of a resistance group within an enemy-occupied country; or as clandestine organ of dissident group in enemy country; or as actual enemy station. Word-of-Mouth Rumors--Planted by agents in an appropriate situation, and sufficiently plausible to retain their credibility. Forgeries--(Commercial Documents, Military DocuÂments, Business Stationery)--Used to intimidate collaborationists, implicate enemy officials, and harass the enemy's secret police. Poison Pen Letters--Disguised as letters from actual business firms, soldiers, or other individuals, and containing incriminating information. Bribery--Inducing enemy officials to perform acts favorable to our cause. Operational Ruses--False military orders, manifestos, and demoralizing rumors disseminated behind enemy front lines to induce surrender or tactical withdrawal. Extensive and highly successful clandestine ferrying operations were carried out in the Aegean Sea. OSS personnel and supplies were transported to Greece in support of native resistance groups and guerrilla forces. A fleet of calques (native fishing boats) plied between Cyprus and secret bases in Turkey. From these bases smaller craft took over making pinÂpoint landings at night on the Greek coast. In addition to landing agents and keeping them supplied, this ferry service evacuated many refugees and downed flyers, rescued and brought to evacuation points by Greek guerrillas. MU planned and supervised the operations of the San Marco Battalion, an amphibious group of the Italian Navy. This group was trained in the methods of sneak attack and marine sabotage. They operated on the coast of the Tyrrhenian and Adriatic seas. They have a long record of successful misÂsions involving demolition attacks on shore installations within striking distance of the coast. Maritime Branch in conjunction with U.S. Navy operated PT boats from British bases to the continent. It also secured for the British for ultimate use by Allied forces, sub-chasers which were making successful runs in the North Sea. In this theater Maritime handles the water transÂportation for all other OSS branches. In this conjunction, personnel and equipment were ferried up and down the Burma coast from Akyab to Ramree. Maritime swimmers went in and made reconnaissance determining beach and shore installations before the British Army forces landed. Other Maritime personnel were actively engaged on submarines as escorting officers. As such, they landed Military and native personnel and supplies and equipment behind enemy lines. Operational Strength--566 Americans, 9200 Kachin Rangers. Operations--Guides and security patrols for Merrill's Marauders, MARS Task Force, British and Chinese forces. Evacuated 470 Allied wounded, 228 U.S. Airmen. 85% of intelligence for North Burma campaign. 75% of 10th Air Force Targets. 100% of ground damage assessment. Killed 4,350, capture 53 Japanese. Identified 922 Japanese agents. Leaflets, rumors, and radio beginning to change Japanese surrender policy. 4,000 tons arms and supplies by air. Opertational Strength--59 Americans, many native sub-agents. Operations--Detailed intelligence on Southern Burma, Tahiland, Malaya and Sumatra. Brought out Thai official to confer with State Department. Location of enemy radar. Location of POW camps. Assessment of air raids. Selection of air targets. Operational Strength--185 Americans, 5,000 Chinese authorized. Operations--Organizing and training 20 Chinese Commando groups. Destroyed 175 bridges, 3 tunnels, 19 ferries, 1 airdrome. Agents supplied 57% of ground intelligence to 14th Air Force resutling (eg) in destruction of 9,000 Japanese calvary. 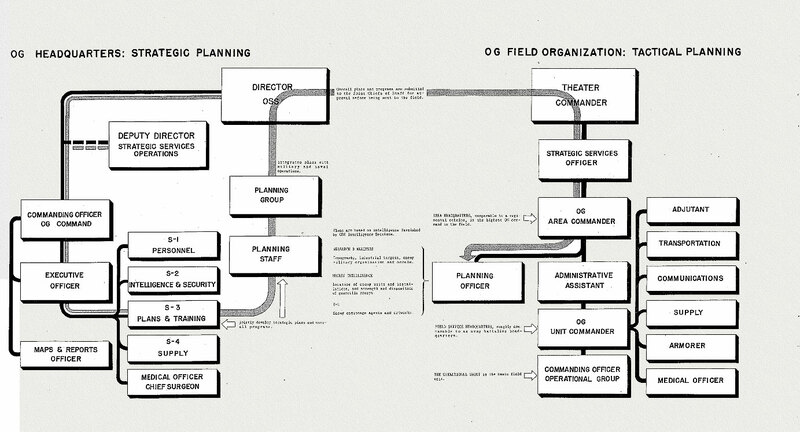 AGFRTS, SACO, and other OSS sources supplied a third of all ground intelligence received by G-2 in theater. Identified 535 enemy agents. There are two Strategic SerVices Officers in the Far East--one for the India-Burma Theater, and one for the China Theater. The SS Officer for I-B is responsible for OSS activities in Southeast Asia and in the India-Burma-Thailand area. His main base is in Kandy, Ceylon, and there are important sub-bases at Calcutta and New Delhi, India. The nearly-autonomous unit known as OSS Detachment 101 also comes under the SS Office for I-B. This Detachment's job in Burma has come to an end, and its personnel is being absorbed in other areas--chiefly in the China Theater. This Detachment was the earliest OSS Unit in the Far East, having been established in late 1942 in upper Assam, India, for intelligence, guerrilla, and sabotage work behind the Japanese in Northern Burma along the path which General Stilwell's forces had to take to clear the land supply, route to China. 101 organized, directed, equipped, and trained several thousand natives of Burma for guerrilla operations; operated a small air group for supply and liaison with field groups behind the Japs; set up machinery which worked very efficiently for the rescue of downed Allied fliers. (See accompanying chart.) This Detachment was established by the SO Branch, and it became one of the most successful OSS enterprises. It has stood as an example not only of adaptability to peculiar conditions, but also of inter-Branch cooperation and united Branch operations in the direction of a common goal. OSS forces in SEAL, under the same SS Officer for I-B, are responsible for operations in the rest of Burma, Malaya, Thailand, and Sumatra. It is known as OSS Detachment 404. Due to a slower start, to the nature of the over-all strategic picture, and to the vast water transport problem, the task of this Detachment has been much more difficult than the task of most OSS organizations overseas. Its operations in Thailand have been brilliantly successful. A chart of OSS/I-B organization is not included here. The organization is rather complicated because of its scattered character with bases in India, Ceylon, and Burma. But the following chart and text describing OSS organization in China is fairly typical of OSS organization in the Far East and will give some idea of the I-B setup. This chart presents the OSS organization in China based in Kunming (the major base for OSS operations) and in Chungking (residence of the Strategic Services Officer for China.) The SS Officer is directly responsible to the American comÂmanding general for the theater and to the Director of OSS, Washington. 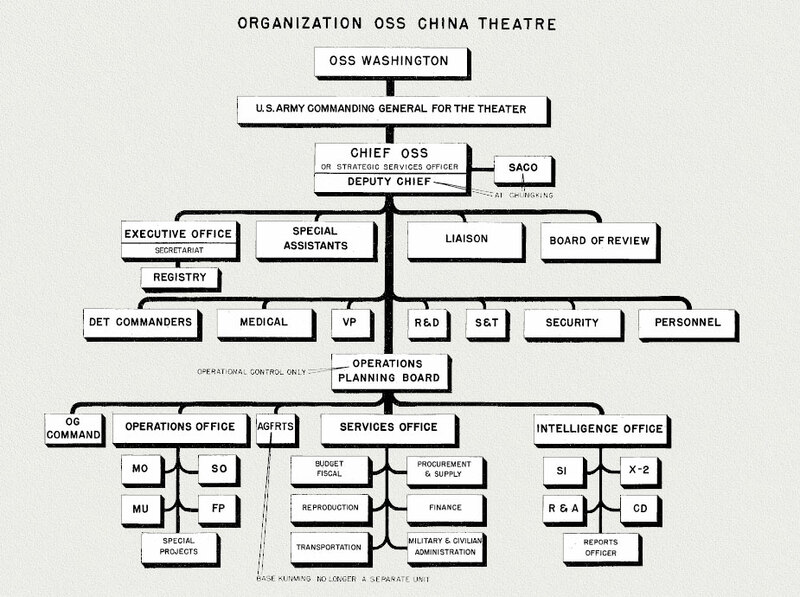 The China OSS organization (like OSS in most theaters) has many similarities to the OSS Washington organization. All the Branches are represented, and in many instances their personnel share common quarters and offices. The Operations Planning Board bears the same relationship to OSS China as the Planning Group and Planning Staff bear to OSS Washington. just as it was found impractical by experience to direct operations entirely from the United States, it has been found impractical to plan and coordinate operations from a distance. The OSS China organization has been split into three distinct geographic commands (not shown in this chart), each one of which is a replica on a small scale of the base organization--which is shown in the chart. 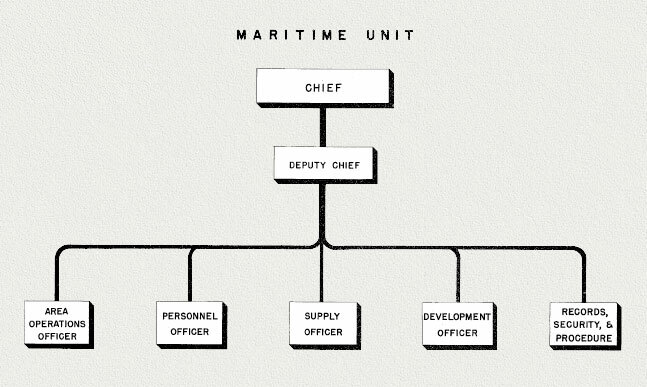 Each of the three sub-areas are commanded by separate OSS officers, and all the Branches are represented on their staffs. The three areas administered from three sub-bases cover (a) North China down to, approximately, the Yellow River, (b) Central China including the coastal regions down to, approximately, the Indo-China border, and (c) Indo-China and contiguous regions in South China. The OSS officers commanding these three areas are directly responsible to the SS Officer, China Theater. This arrangement gives considerable flexibility to OSS operations in China in a rapidly expanding strategic situation. Two features of OSS China deserve special mention. The SACO-unit is a Chinese-American joint intelligence effort staffed with Chinese and Americans for the mutual exploitation of certain intelligence channels. The SACO unit is based on Chungking, benefits from intelligence chains already established by the Chinese, and organizes other chains. The Chinese side consists of representatives of General Tai Lits Nationalist organization called the Bureau of Intelligence and Statistics, which has both intelligence and police functions. The American side consists of a U.S. Navy group and an OSS group, both working under General Tai Li. was transferred from the 14th Air Force command to direct OSS control under the OSS Strategic Services Officer and the U.S. China Theater Commander. As a result, its intelligence activities were broadened and its intelligence product made available to a wider circle of "customers." The unit is no longer known as AGFRTS, and it is an integral part of the central sub-area of OSS/China in which it operates. The activities of OSS China are expanding rapidly as the strategic picture in that theater unfolds. 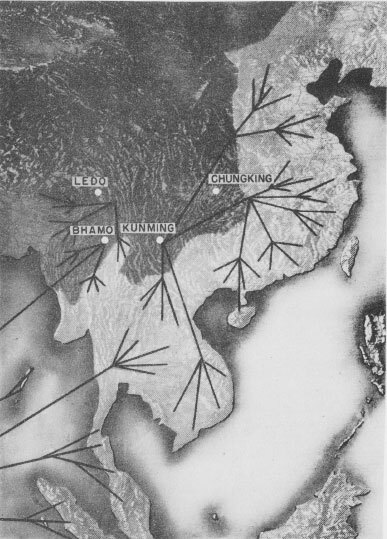 Because of the fluid "lines" throughout China there are almost limitless opportunities for effectively organizing and supplying resistance behind the Japanese. The training and equipping of Chinese OG units, the extension of intelligence chains, and the Wale subversion of the enemy present OSS with perhaps its best opportunity for large-scale operations, particularly since the American Army is so far not engaged there in any important numbers. With the lessons learned in Europe, and at Detachment 101, OSS in China will be able to coordinate all its weapons against the enemy as never before and will operate through the air, on water, and on land. Unprecedented demands will be made upon the OSS Branches offering supporting services to the intelligence and operational Branches:--supply, transport, services, training, communications, and medical. As seen in the preceding chart (Intelligence and Operations--FETO), the scope of the OSS effort in China is already impressive. 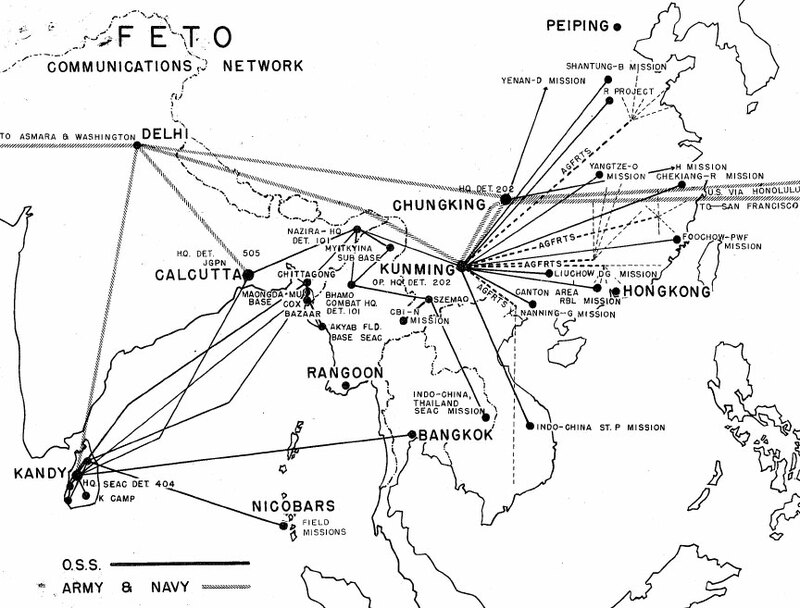 This chart gives some idea of OSS communications coverage in the Far East where vast distances separate points which must be joined quickly via radio. Navy and Army trunk communications channels are used where possible, but most of the coverage, especially with the innumerable field teams and sub-bases, must be maintained by OSS itself. The Communications Branch maintains these lines of communication, staffs the stations, furnishes operators for field missions, and supplies equipment. This Branch does not handle pouch communication; existing Army or State Department pouch facilities are used by OSS. But the Communications Branch has used pigeons with good results in Burma, and it has instituted the OSS system of cipher for radio messages.